Trying to keep a teenage boy fed has turned out to be much more challenging than I ever anticipated. There are days when I really feel like I’m failing. The temptation to grab fast food is great and let’s be honest, most teens will choose to eat greasy fast food if given the option. 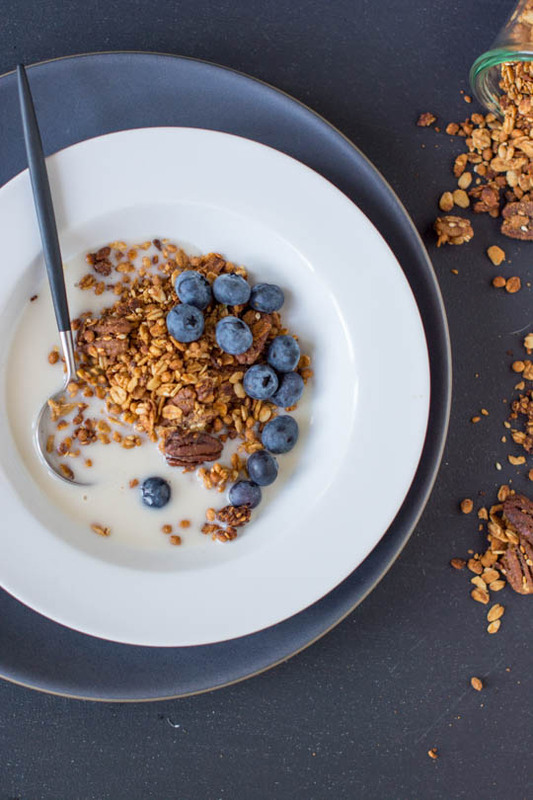 And when you have to plan on breakfast, lunch, snacks and two dinners a day you are bound to be tempted by shortcuts. I try to keep healthy options around but he manages to always gravitate towards the processed snacks I have hiding in the pantry and the fresh fruit I buy ends up withering on the counter. My son is a lot more open to trying new foods and wants to eat better but like all of us he is tempted by things full of fat and sugar. Giving him some healthy options for meals he can put together himself is really important for those times I’m not available to cook for him. Since he’s developed a dairy sensitivity it’s been a lot easier to get him to try things that he would have turned his nose up to before. 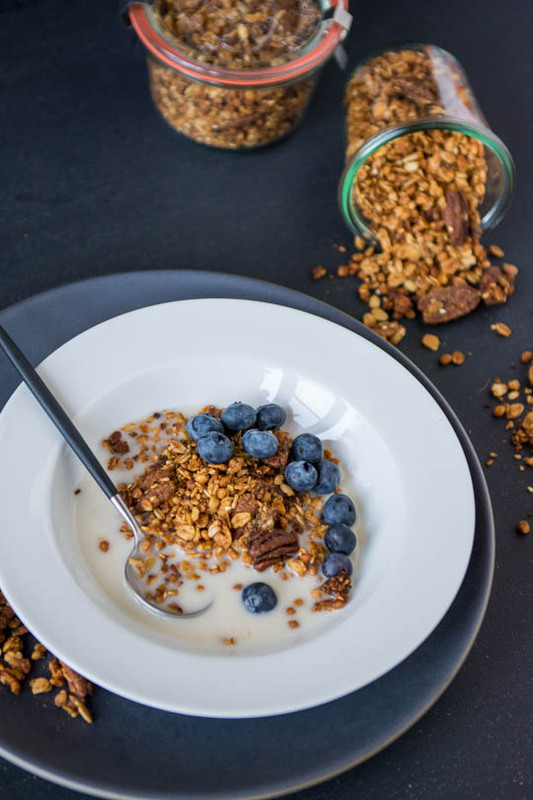 Having a batch of granola in the pantry for him is a great option for breakfast and snacks. I was inspired by his favorite peanut butter banana sandwiches and it has the added benefit of using up all the extra bananas I have languishing in the freezer. 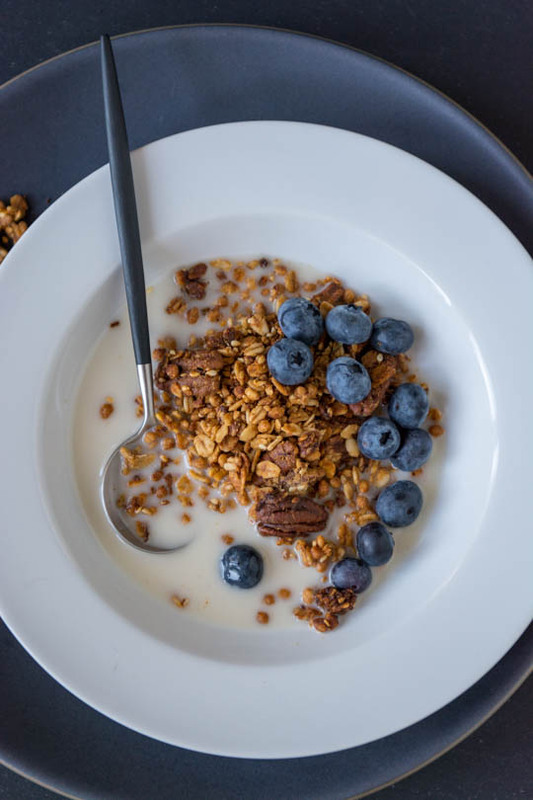 You can easily switch out the nuts in the recipe for your favorites or omit the crispy rice cereal but try to keep the ratios the same so you get the same results. 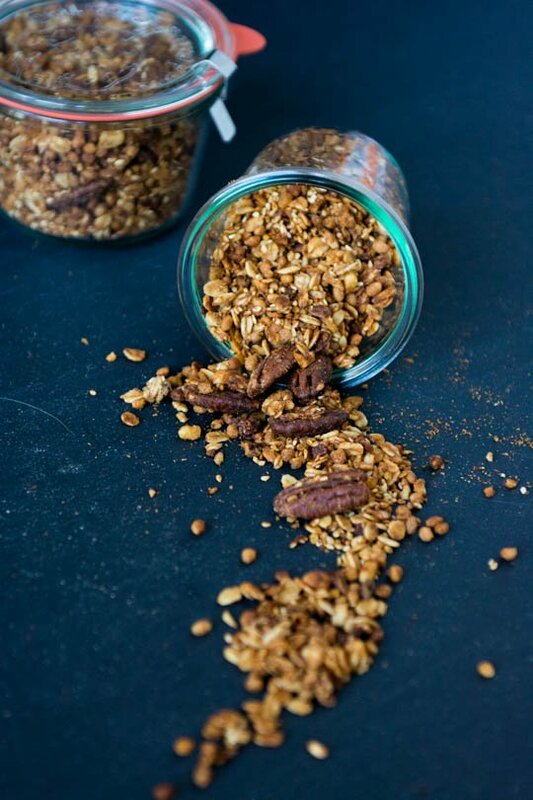 If you have a sensitivity to peanuts, almond or your favorite nut butter can be substituted. Pre-heat the oven to 350 degrees. Line a large rimmed baking sheet with parchment paper. 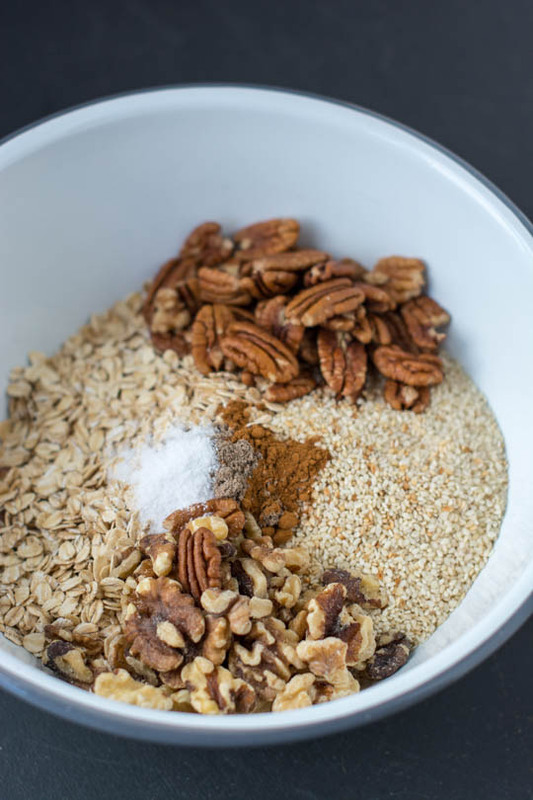 In a large bowl, stir together the oats, rice cereal, sesame seeds, walnuts, pecans, salt, cinnamon, and cardamom. 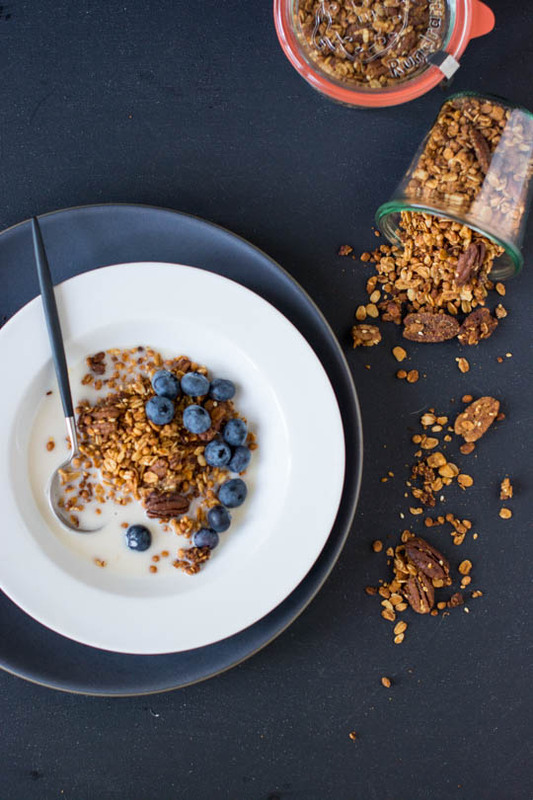 In a small bowl, stir the mashed banana, maple syrup, nut butter and coconut oil together until well combined and then pour over the oat mixture and mix well to combine. Pour the mixture onto the prepared tray and spread in an even layer. Bake for 25-30 minutes until golden brown, stirring once to ensure that it bakes evenly. Let cool completely, the mixture will firm up as it cools. Store in an airtight container at room temperature for 3 to 4 weeks. 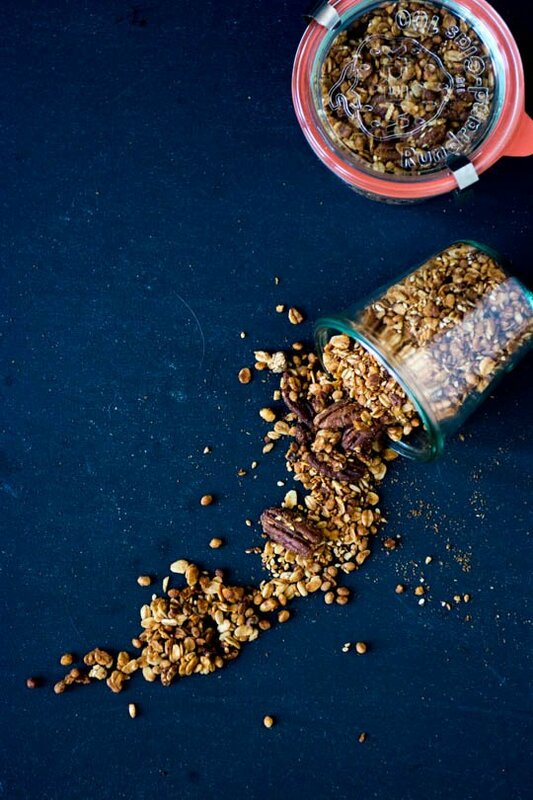 You can also freeze the granola up to 3 months if desired.